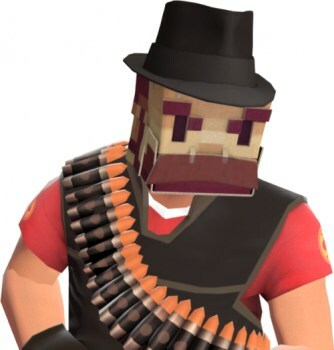 Thanks to the solid dudes at Valve, Notch is now rocking his very own unique Team Fortress 2 hat. Team Fortress 2 hats are all about status and they don't get much statusier than the "Top Notch," a new and extremely rare lid developed by Valve and turned loose over the weekend. How rare is it? So far only a single player has one: Markus "Notch" Persson, the creator of Minecraft. "I got invited to play in the third TF2 Mixup with a bunch of famous TF2 personalities. Robin Walker, my third favorite person at Valve, was there, and kept killing me with his super hax. And by golly did I have a great time!" he wrote on his Word of Notch blog. He scored the Primeval Warrior after playing for awhile, but then later on he was awarded something really special: a hat that looks like a cardboard box with several smaller pieces of cardboard taped to it in the blocky likeness of a face bearing an uncanny resemblance to Notch himself, an effect completed by the fedora that sits atop it all. "Hooooly cow. Thank you, Valve," he wrote. "You wouldn't believe the amount of medic I get now. Also, spies. I am never quitting TF2 again, and you should all go buy it right away. How much is it, you ask? It's FREE! YES!" The Top Notch is available for all classes, but don't hold your breath waiting to try it out yourself. "Welcome to a secret society so exclusive it makes the Illuminati look like a Costco," the Top Notch item description says. "How exclusive? You are the only member. This is the only item of its kind in all of existence. So don't craft it, Miney."